A large 2008 ISECS International Colloquium on Computing, Communication, Control, and Management (CCCM 2008), was held in Guangzhou, August 2008, China. 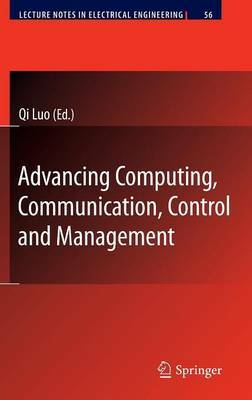 Just like the name of the Colloquium, the theme for this conference is Advancing Computing, Communication, Control, and Management Technologies. 2008 ISECS International Colloquium on Computing, Communication, Control, and Management is co-sponsored by Guangdong University of Business Studies, China, Peoples' Friendship University of Russia, Russia, Central South University, China, Southwestern University of Finance & Economics, China, and University of Amsterdam, Netherlands. It is also co-sponsored IEEE Technology Management Council, IEEE Computer Society, and Intelligent Information Technology Application Research Institute. Much work went into preparing a program of high quality. We received about 972 submissions. Every paper was reviewed by 3 program committee members, about 382 were selected as regular papers, representing a 39% acceptance rate for regular papers. The CCCM conferences serve as good platforms for the engineering community to meet with each other and to exchange ideas. The conference has also stroke a balance between theoretical and application development. The conference committees have been formed with over two hundred committee members who are mainly research center heads, faculty deans, department heads, professors, and research scientists from over 30 countries. The conferences are truly international meetings with a high level of participation from many countries. The response that we have received for the congress is excellent. This volume contains revised and extended research articles written by prominent researchers participating in the conference.